The CALIFORNIA AIR TOOLS 4620AC-22050 Ultra Quiet air compressor is designed to be one of the quietest 2 horse power air compressors in the industry having only 70 decibels of sound. 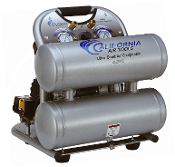 The 4.6 gallon aluminum air tank is (67.2 lbs) and rust resistant making it very easy to transport. This air compressor is ideal for anyone working inside where noise is a major issue and high air delivery is required! * Continetal / Central Europe (Schuko) CEE 7/7 Plug & Cord included.